Spots available April 5-11, 2020, book now! The classic Wapta Traverse runs roughly north-south across the expanse of the Wapta and Waputik Icefields passing by four ACC huts. The east-west crossing, from Bow Lake to Takkakaw Falls and the #1 Highway near Field, BC is a classic traverse in its own right, but a much more serious one due to the 20-km crossing between the Bow and Stanley Mitchell huts. The new Louise and Richard Guy Hut at Mont des Poilus breaks up this crossing, making the trip safer and more comfortable and accessible. The Bow Yoho Traverse - a new Wapta Classic! 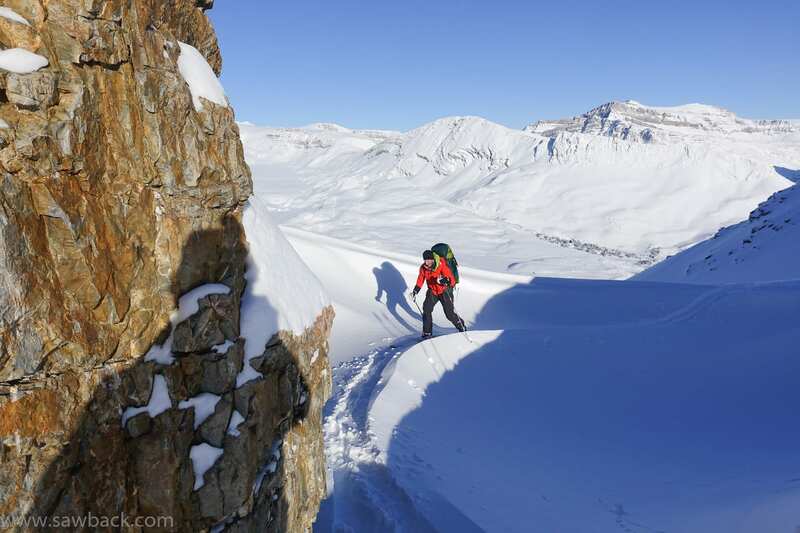 For decades, the Wapta Traverse has had a legendary reputation as a destination for ski mountaineering. Really, it has it all: an excellent hut system, perfect terrain for traverses, and easy access to excellent ski mountaineering objectives. The best time of the year is late March to late April when the snowpack is settled and you can still count on dry powder runs; this trip is right in that perfect window. A near neighbour, the Bow-Yoho Traverse, crosses the Wapta at about a 90 degree angle. It is just as good, but it has only gained popularity recently, with the addition of the ACC's most deluxe hut yet: the Richard and Louise Guy Hut. Situated between Bow and Stanley Mitchell Huts it turns a daunting 12+ hr day into two short days. This new hut also provides a staging point for objectives around the Des Poilus Glacier zone: Mt. Collie, Mt. Des Poilus, and Yoho Peak are a few of the options that previously required either very long days from huts, or a high camp. Now you’ve got the state-of-the-art Guy Hut to return to at the end of the day! We will spend our first nights at the Bow Hut, two nights at the Guy Hut, and a final two nights at Stanley Mitchell Hut. Our traverse begins in Field, B.C. with a gourmet dinner at the famous Truffle Pigs Bistro, as well as a hotel stay - both included in the trip price! I've found that this is a great way to set the tone for my Wapta trips and a great chance to mingle with the group before the tour begins. This itinerary is longer than some other Bow-Yoho trips offered, giving us more time to explore the incredible ski mountaineering available instead of putting our heads down and charging through the traverse. A printable version of this information package can be found here. We will meet for dinner at the Truffle Pigs Cafe in Field on "Day 1" at 6:00 pm (see Itinerary tab). After dinner we'll have a look through your equipment to make sure everything is in order as well as distribute group equipment. Please be on time: However, if for some unforeseen reason you cannot make it, please give me a call or text ASAP, Tom Wolfe at 403-707-9996. I look forward to spending the week together with you and exploring the amazing ski terrain that the Bow Yoho Traverse has to offer! Hut elevations are approximately 2200 m with 700 m vertical and covering 10-15 km/day on average (5 to 7 hrs travel). Ski crampons are a must for spring ski touring, and they can make a big difference even on a powder skiing week at times. If you have any difficulty obtaining these please let me know. We have some spares and can likely set you up with a pair. If you have telemark bindings, G3 crampons have an attachment system that works well for most tele bindings. Skis, preferably with tech-style Alpine Touring (AT) bindings, 150-185 cm in length, wide (100 mm+ at waist) for powder skiing. Telemark, frame-style AT bindings, or splitboards are acceptable as well, please contact us if you plan to bring one or these alternate touring systems. Sleeping Bag. We recommend a three season bag rated between -7 to -9°C. Bring a compression stuff sac so you have room in your pack for other things. Your guide will bring all of the necessary group gear. If you are in need of loaner/rental gear please arrange with us ahead of time to provide it for you. We have most of what you might possibly need available either at an inexpensive rental rate or free of charge depending on the item. April is the best month to do the Rockies hut traverses. Early April is likely to be a bit cooler and have powder skiing even on the solar aspects. The Rockies has a thinner snowpack than the Selkirks or Coast mountains, but by April the snowpack tends to be robust and the crevasses well covered. Expect temperatures in the -10C to 0C range, but be prepared for lows as cold as -20C or highs up to +5C! 6:00 pm -- Introductions over dinner in Field, BC at the “Truffle Pigs Bistro” (dinner is included in your trip fees). In case you haven’t heard of it -- this is one of the finest restaurants in the Canadian Rockies! After dinner it’s back to your rooms where your guide will pay you a brief visit for an equipment check and distribution of group gear and food. 8:00 am -- a leisurely breakfast, again at the Truffle Pigs cafe. Bagged lunches will be provided by Kicking Horse Lodge. Make sure your backpacks and ski gear are packed and ready to go. The ski from Bow Lake to Bow Hut takes anywhere from 3 to 5 hours depending on conditions and group speed. There should be time left at the end of a day for a quick lap on the awesome slopes above Bow Hut at the end of the day. Traverse day. We’ll set our course west for the Guy Hut, traversing over the Gordon-Rhondda pass, over the Yoho Glacier’s gnarly icefall, below the spectacular Mt. Collie, and a short distance down to our hut below Yoho Peak. Peak bagging day. The Guy Hut is not only the premiere hut on the Wapta, it’s also an excellent staging point for many of the great ski runs in the area including Yoho Peak N and SE faces, Des Poilus SE face, the subpeak to the north of Des Poilus, Mt. Collie, to name the plums of the area! There are two ways to get to Stanley Mitchell Hut, both pretty darned exciting. The first, over Isolated Col, is steep and relentlessly exposed to avalanche hazard on both the north and south sides. The second is over the Whaleback, which has less avalanche hazard and which in the right conditions offers a good ski descent through a lightly treed avalanche path to the valley bottom and then a trudge up-valley to the famous and ancient Stanley Mitchell Hut. In the winter of 2018 -- all three times! -- avalanche hazard was low, so we dropped our loads at the top of Isolated col for a hot lap on the outstanding 300 m north facing side (back towards Des Poilus) for an outstanding powder run, and completed the day in style with a long descent down the south side. This old log structure has been shelter to thousands of skiers since the early days of mountaineering in the Canadian Rockies. If you’re in the Little Yoho Valley with the wood stove crackling then you will definitely want to stay for at least one more night…. So that’s our plan. Our last full day of adventure offers opportunities at bagging the Presidents, Mount MacArthur, Isolated Peak, Mt. Kerr, or doing some cool loop trips or storm skiing on the Vice President trees or glacier. The ski out from Stanley Mitchell Hut is best if you can head up over the Iceline trail and out via Yoho Pass and Emerald Lake Lodge. This requires good stability and cool conditions, so we might have to slog out via Takakkaw Falls road. Either way, we will aim to be back in Field by 2 pm at the latest. This is the end of the trip. You have the option of kicking back by the shores of the Kicking Horse for another night (extra charge applies) or jetting back home.